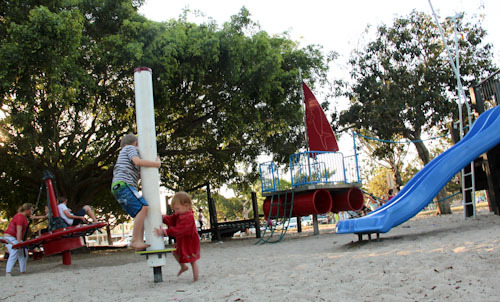 When I needed to find a place to meet a friend with small children, I decided to use the opportunity to visit a highly-recommended playground in Brisbane’s bayside. 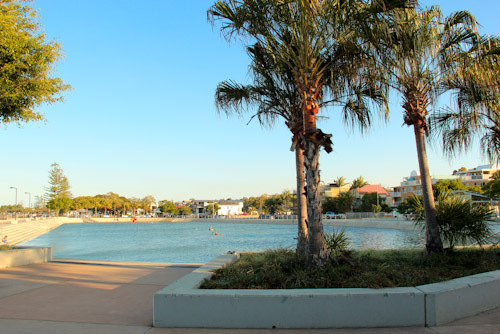 Wynnum has developed a wonderful, family-friendly space on the esplanade alongside the sandy beach. It has a traditional playground, a water-feature playground, a huge wading pool and many shady trees, bbqs and lawn areas for picnickers. We picked up our bus last night, and a hasty packing job meant we had swimmers, towels, things to eat and dry clothes close at hand. The park was very busy when we arrived at about 11.00, and it was difficult but not impossible to find a parking spot. 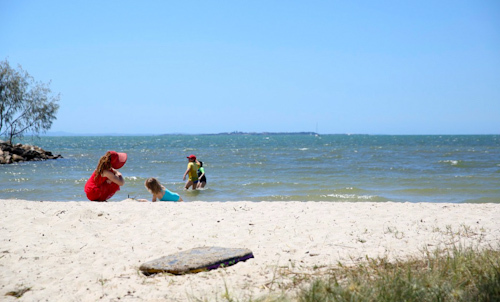 The water at Wynnum's beach is part of Moreton Bay. 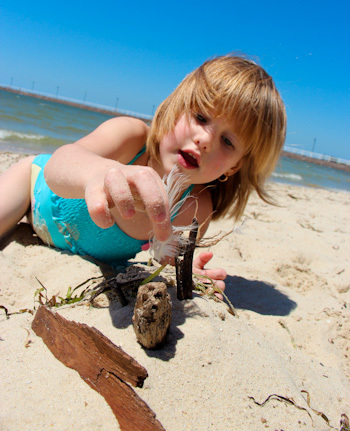 A line of fine seaweed sits at the high-tide mark, providing a great source for decorative features on sandcastles. Calista finds a feather to top her beautiful princess' castle. 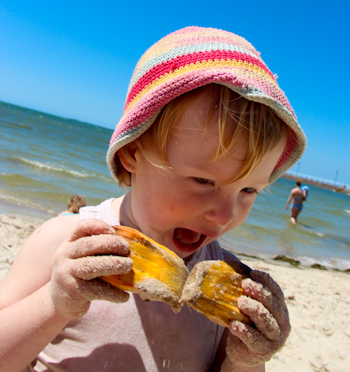 Delaney pretends to munch on pandanus fruit. 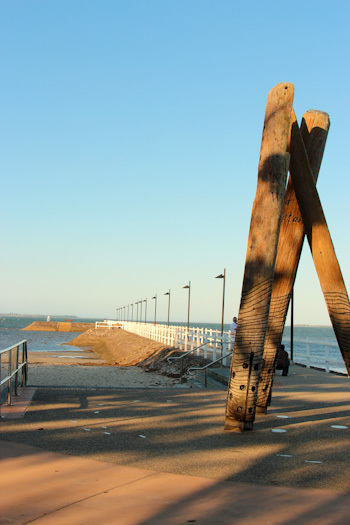 Three timber totems stand guard at the edge of Wynnum Jetty. 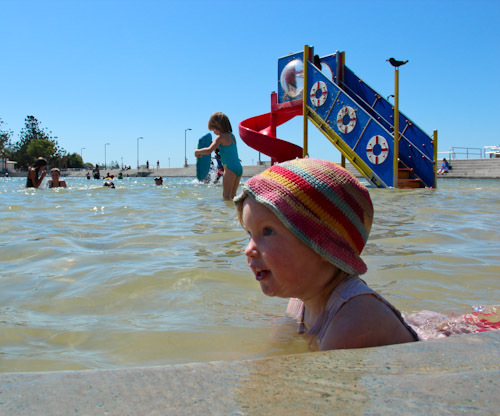 Adjacent to the beach, and filled with seawater, a large wading pool attracts scores of children on hot days. Calista goes down the steps to join her sisters in the shallow water. At one end of the wading pool, a small slide provides added interest. This is the perfect location to meet my friend Georgia and play with her two children. Delaney likes excavating the sand at the bottom of the pool and moulding it into little piles on the steps. At around 1.30pm, many families had gone home, and I could move the bus to a spot close to the pool. Georgia and I could move from the pool-side to the bus along with the children. It was great to be able to relax out of the wind or in the sun, following the natural movements of the children as they decided what they wanted to do at any given time. 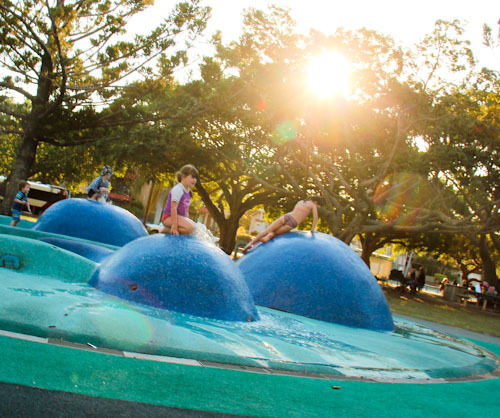 The adjacent playground also uses water to enhance its attractiveness on hot days. Our girls explore the equipment on offer. 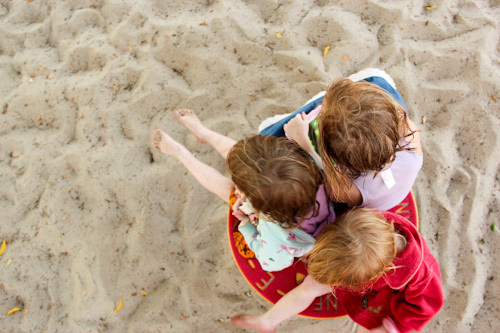 Three girls settle on one spinning disk for a ride. 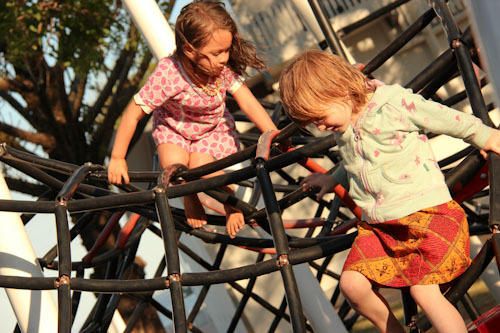 In a subtle competition of bravery, Calista and Priya climb up as high as they can manage. 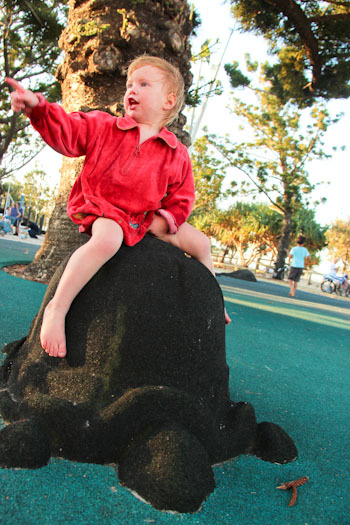 Delaney orders her turtle to carry her to the west. It was so lovely to spend the day with Georgia and her two children. She parents in a gently, loving manner, and we look forward to spending more time with her family in the future. 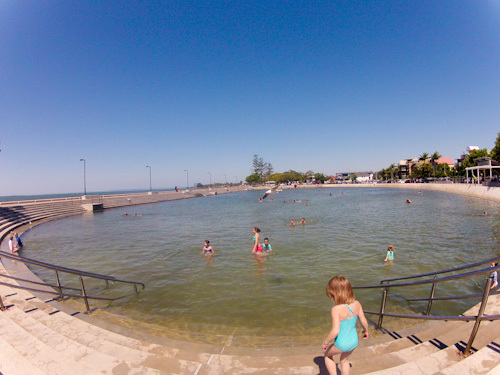 Wynnum Wading Pool exceeded our expectations. There are enough activities as options for a family with a wider range of children’s age — I hardly saw Brioni and Aisha until they were hungry! — and yet it’s also a relaxing place for parents to catch up with their friends. I know where we’ll be driving on hot days in the future! That wading pool is such a good idea! I love that it’s filled with sea water. Photos like these make me wish I lived in Australia with your gorgeous weather and warmth (I’m in AKL and it’s stormy today!). That saltwater wade pool is one of the coolest things I’ve ever heard of. Very nice! That park has heaps to offer everyone. We love it! 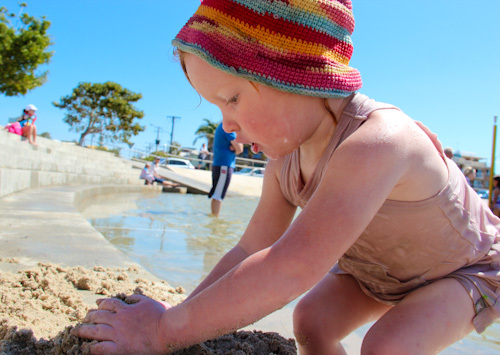 It’s similar to Settlement Cove, but I love how with Wynnum u have just that much more access to the beach, and I find managing the kids movements at Wynnum much smoother too. This is definitely a location I look forward to visiting with my children in the future! I use to take my daughter here all the time when she wa small. It was a beautiful place to live with small children. Your photos bring back fond memories.